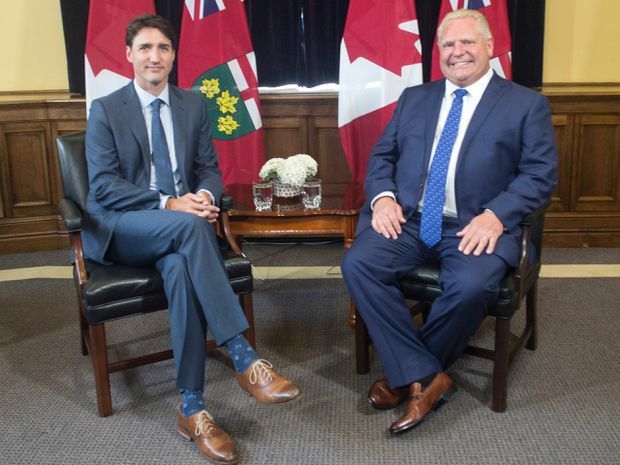 Prime Minister Justin Trudeau and Ontario Premier Doug Ford, at Queen's Park on Thursday, ,July 5, 2018. Ontario has withdrawn its support for the resettlement of asylum seekers who are crossing the border illegally, with Premier Doug Ford saying that the federal government created the problem and should bear the full burden of fixing it. With the federal government paying a fraction of the cost of resettling migrants and Ontario now backing away from an earlier commitment made by the former Liberal government, cities in the province are worried about who will pay for overtaxed public services and shelters. The move on resettlement costs is part of a brewing political conflict between the provincial Tories and the federal Liberals. It comes as the province’s Attorney-General, Caroline Mulroney, says in a letter to Toronto Mayor John Tory that the federal bail system is allowing “too many violent criminals back into our streets,” and follows the cancellation of the provincial cap-and-trade program for pricing carbon. Mr. Ford made his announcement on asylum seekers shortly before meeting with Prime Minister Justin Trudeau for the first time, leading to a series of pointed remarks on Thursday from federal and provincial officials. The Premier said in a statement that Ottawa had created a “mess” on the country’s borders, which is now threatening Ontario’s public services. Standing in the lobby at the Ontario Legislature building after meeting Mr. Ford, the Prime Minister said that the newly elected Premier was not well-briefed on the refugee issue or Canada’s international obligations. Ottawa has so far set aside $11-million to help Ontario deal with the added costs of asylum seekers. That money has yet to be dispersed. The Ford government says Toronto alone could need $75-million, with other cities and the province requiring millions more. With more than 3,000 refugees in Toronto, the federal government will now organize the data collection and response to the asylum issue that the province had committed to last year. Federal officials face a tight deadline with 800 refugees currently housed in college dormitories that will need to be empty for the arrival of students in early August. Toronto has warned that community and recreation centres might need to be closed to the public if hundreds of new housing spaces aren’t found before then. Mr. Trudeau said federal officials would move quickly to clarify how they can work with the provincial government. “This is obviously something fairly important. It didn’t seem to me that the Premier was quite as aware of our international obligations to the UN Convention on Refugees as he might have been. So I spent a little time explaining how the asylum-seeking system works and how our system is supposed to operate,” the Prime Minister said. He added that he tried to assure Mr. Ford of the difference between a refugee and an economic migrant. Mr. Ford has not taken any questions from reporters yet in his time as Premier. However, Lisa MacLeod, Minister of Children, Community and Social Services, said that Mr. Trudeau’s comments were “disrespectful” of him. The federal Conservatives applauded Mr. Ford’s move “to protect the interests of taxpayers and the integrity of our asylum system,” according to a statement. Mr. Tory has been vocal about the need for cash and declared last month that the city’s shelters could no longer accommodate more asylum seekers. He issued a statement on Thursday that does not mention Mr. Ford by name but demands help from Ottawa. Mr. Tory said he was speaking regularly to federal Immigration Minister Ahmed Hussen and that he would urge Ottawa to take immediate action. Toronto Liberal MP Adam Vaughan says Ontario’s move means that a planned refugee “triage centre” and the provincial co-ordination needed for a new system to divert refugees to places other than Toronto’s shelters is off the table for now. Officials from the federal government, the province and the city had been working on such a plan during the provincial election campaign, and were awaiting approval from Ontario’s new government. Mr. Vaughan, the parliamentary secretary for housing and urban affairs and a former Toronto city councillor, said the federal government will have to step in with help for Toronto and other cities, while trying to create a co-ordinating system from scratch. The RCMP has intercepted more than 9,400 asylum seekers along the Canada-U.S. border this year, mostly in Quebec. That’s in addition to the 20,000 asylum claimants – mostly Haitians − who flooded the border last year over fears that they would be deported back to their home country under President Donald Trump’s plans to end their temporary protected status in the U.S. Although the majority of irregular asylum seekers have arrived through an unofficial crossing point near St-Bernard-de-Lacolle, Que., many have settled in Montreal and Toronto as they await the outcome of their refugee claims. Last month, Mr. Hussen said Ottawa would provide $50-million to Quebec, Ontario and Manitoba to help them pay for some of the extra costs incurred from the influx of asylum seekers. Of that amount, $36-million has been set aside for Quebec.